Pet fish offer a nice alternative for busy households or for families with members who are allergic to dogs or cats. You don’t have to walk, groom or clean up after fish every day. And while it’s true that you can’t pet or cuddle with fish, there are some aquarium buddies who do have friendly and interesting personalities. Some fish learn to recognize their owners, others can be fed by hand and still others entertain families with their fun antics or their habit of rearranging ornaments in the aquarium. Before rushing out to purchase a fun fish, do some homework just as you would before adding any new pet to the family. 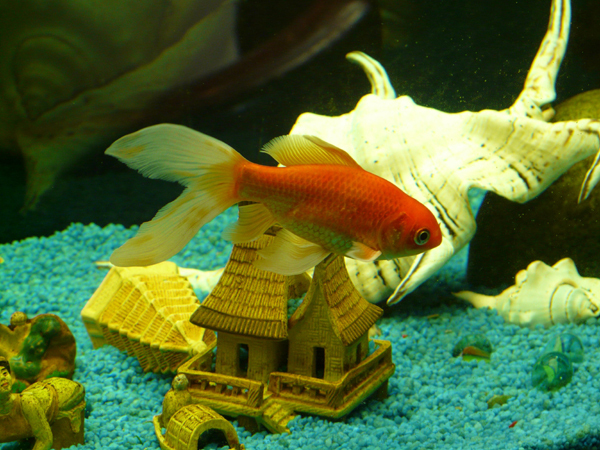 When deciding on what type of fish or what size tank you want, consider your living space. The rule of thumb is an inch of fish per gallon, so keep that in mind when choosing a species of fish. The fish tank needs to be kept out of direct sunlight so as to prevent the growth of algae, placed away from air vents that can cause fluctuations in water temperatures and needs to be located within easy access to electrical outlets. Also, think about the reason why the family wants an aquarium. Is it to be placed in one family member’s bedroom, or in the living room where everyone can enjoy it? Oscars are freshwater fish in the cichlid family and they have diverse friendly personalities. These fish learn to recognize their owners and some have been taught to take fish from their owner’s hands. These fish love to move items around the aquarium and hobbyists who keep cichlids enjoy watching their fish moving ornaments around the tank. Pufferfish are brackish water (require a certain amount of salt in the water) fish. They have an inquisitive nature and like to explore anything new in their environment. Some owners speak of their puffers as “playing” with them as they dart back and forth in the tank watching family members move around the room. Clown Loach are beautiful fish with orange, red and black stripes. They will come right up to the front of the tanks to watch what’s going on in the room. These fish enjoy swimming back and forth alongside anyone walking beside their tank. Flowerhorn cichlid is a beautiful colorful fish with a great personality and a keen interest in the surrounding environment. This fish will take food from its owner’s hand and will come right up to the front of the tank to greet family members. Red Devil cichlid is a colorful fish that can either be a deep red, pink, orange or orange and white. These are beautiful fish that are a favorite at fish shows. These fish have been known to form attachments to their owners and have been reported to beg for food, and watch their owners as they walk around a room. They also enjoy showing off their colors and speed and enjoy playing in their tanks.